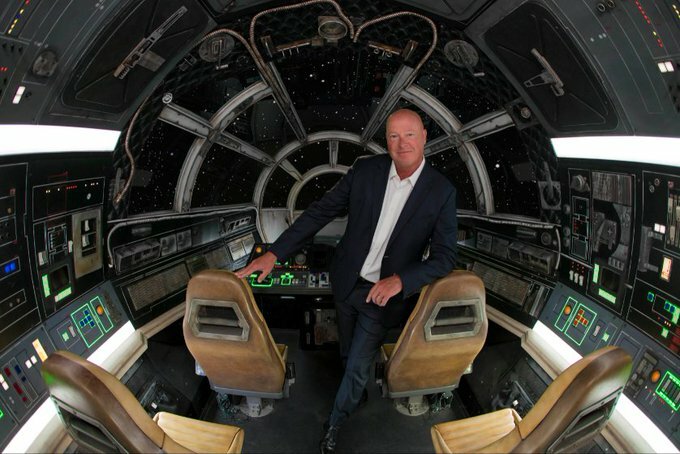 "Star Wars" fans who have been dreaming of flying the Millennium Falcon for four decades will get the chance to climb into the cockpit and pilot the famed starship on the new Smugglers Run attraction coming to the Galaxy's Edge themed land at Disneyland. But how do you actually fly the Falcon after you've taken your seat in one of the pilot, gunner or flight engineer positions? Which one of the 200 fully functional buttons, knobs and switches in the cockpit do you need to activate to properly operate the greatest hunk of junk in the galaxy? Your success or failure on your mission aboard the Falcon is important because your reputation as a smuggler will follow you around Black Spire Outpost on the Star Wars planet of Batuu, the setting for the new Galaxy's Edge themed land. Step into Oga's Cantina after crashing the Falcon and a bounty hunter might tap you on the shoulder looking for a space pirate's lost loot. Riders will enter the Smugglers Run ride queue through Ohnaka Transport Solutions, a shady shipping operation run by Hondo Ohnaka, a dreadlocked space pirate with six tusk-like chin protrusions. Riders will receive their smuggling mission from an audio-animatronic Hondo before moving into the hold of the Millennium Falcon and eventually the cockpit of Han Solo's famed YT-1300 light freighter. "This is an experience that's all about touching buttons, playing with buttons. It is highly, highly encouraged," said Walt Disney Imagineering executive creative director Asa Kalama. "Now, you need to be careful because the buttons already duct into the very systems of the Millennium Falcon. Depending on what you push it might have the desired effect or an unintended consequence." "The one that's flashing," said Walt Disney Imagineering producer Jacqueline King. "We have our pilots up front," Kalama said. "It is truly up to them to pilot the ship. Depending on how they do, that will determine the overall physical health of the ship." The gunners in the middle seats are responsible for pushing an array of buttons that fire the Millennium Falcon's weapons systems. "Because we are a smuggling operation, chances are we may come up against folks who are not too happy about what we are up to," Kalama said. "It will be up to the gunners in the middle to provide defense for the Millennium Falcon. If they don't line up the TIE fighters fast enough, the hull is going to get riddled and the ship is going to shake violently." "You're going to keep firing them and take out anything that you meet along the way," King said. "There are a lot of spires in Black Spire Outpost," Kalama said. "If you run into one and the pilots don't steer out of the way, the ship's going to crash into them. Warning alarms are going to go off and it'll be up to the flight engineers in the back to make sure that they keep the ship in working order." "The pilots are bumping into things," King said. "The ship is coming apart because she's always coming apart to some degree. Your job is really to help keep her running. You've got to keep all the systems going so that you can make it to the end." "Everybody gets their own role," King said. "You can play your own game even though you're part of a larger team. We hope for a lot of collaboration between everybody, because that will overall make everybody more successful." But the video game-like attraction also keeps track of each rider's success and failure during the mission. "You get to compete against yourself, especially if you play multiple times," King said. "You'll know how well you did last time. This time if you took out more TIEs, you did better." Your reputation as a pilot, gunner or flight engineer will stick with you during subsequent visits to Galaxy's Edge. "We do want it to feel like a consequential act," Kalama said. "Flying the ship cleanly and beautifully or smashing it to the point where it's on fire is something that people would know about and talk about it." Millennium Falcon: Smugglers Run debuts at Star Wars: Galaxy's Edge on May 31 at Disneyland and Aug. 29 at Disney's Hollywood Studios in Florida.